Forest Culture: ‘A word of mouth tradition, encompassing laws, mythology, skills, experiences and insights of people, applied to maintain or improve their livelihood over generations in a woodland environment’. As part of The Lough Neagh Landscape Partnership’s project “South Lough Neagh Heritage Apple and Native Tree Project”, (funded by Heritage Lottery Fund) I was invited to help put together and deliver a tree Heritage Project. 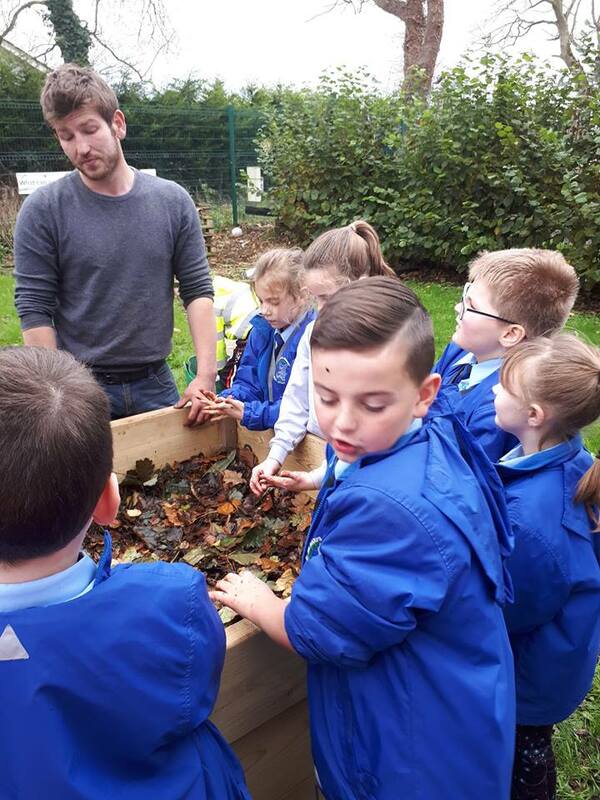 The basis of this project is to raise awareness of the heritage of unique trees and fruit that grow in the South Lough Neagh Landscape, by working with five local schools. It would be a grassroots citizen-led initiative will inspire the creation of new community native woodlands in the area whilst exploring the art, science, and technology of managing trees and forest resources in the Lough Neagh landscape ecosystems for the physiological, sociological, economic, and aesthetic benefits trees provide society. They remind us of the changing seasons and the natural world’ their fantastic legacy has been deeply forgotten. Historically, the Lough shore was a vastly wooded area – this can be picked up by looking at the townland names remaining heavily wooded up until the mid-1600s. Killultagh, the great forest of Ulster, formed a triangle lying between the shores of Lough Neagh, Portmore Lough and the Maze. On the South side of the River Lagan, the area between Strangford Lough and Lough Neagh was designated by district names of Clacan, Clanawle, Clanbrasel and O’Neilland. Between the Blackwater and the Bann rivers, near the Lough shore lay Clancan; to the south Clanawle stretched from the Blackwater to Armagh; and O’Neilland from Armagh to Portadown; and eastwards from Portadown to the Armagh-Down border was Clanbrassel. On the north-west shoulder of Lough Neagh were the Derry and Tyrone oak woods Mountreivelin, Killetra, and Glenconkeyne – the latter merging with the woods of the lower Bann Valley, The Dufferin. This vast forest stretched from coast to coast, east to west and north to south. There are reminders of this everywhere: of the 62,000 townland names in Ireland, north and south, 13,000 have reference to trees whiles 1,600 have a derivation of “dair” (Irish for oak). The shores of Lough Neagh are no exception. Oak woodland was extensive around the shores of the Lough during the early 17th century. By the beginning of the 18th century these oak woodlands had all been cleared apart from a few remnants to the north shore, which were cleared at the end of that century, marking the passing of the old landscape forever. The land that once supported these vast temperate rainforests is now almost entirely converted to agricultural use. Many of the townland names on the southern shore of the lake contain the word ‘Derry’ which strongly indicates earlier extensive occurrence of oak woods. One-eighth of ancient and long-established woodland has been cleared in the last 40 years, and around a third of ancient woods have been replanted with conifers, or a mixture of conifers and broadleaves. Unfortunately, this is a statistic unique not only to Ireland but most of the developed world as we’ve witnessed near total deforestation of indigenous woodland within living memory. As a society, shocking lack of ambition or sense of urgency and a genuine fear of wilderness and wild places are extinction catalysts of what is left, let alone our ability to reach targets of expansion laid out for 2050. There is a Government plan to achieve 12% of land cover by 2050. Sadly, planting has slipped so far behind we’re bordering on deforestation – which seems to have become acceptable. Ironically, if we want to learn more about how to do it and do it well, as well as understand what the benefits are, we should look north to once treeless Iceland. It has plans to ensure 12% tree coverage by the end of this century – an ambition that has widespread support both amongst politicians and the wider public. The Iceland Forestry Society is now the biggest environmental charity in the country. Northern Ireland has fewer trees than any other part of the European Union. 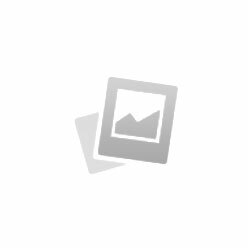 The idea is to, with the help of schools, make a practical contribution to redress this situation by recognising and utilising the profusion of the natural world itself. Our trees annually provide seeds, if we can recognise and utilise this natural resource they have within their grasp the only way to conserve our dwindling tree heritage. The seeds that our existing trees produce each year! From listening to the personal accounts of elder generations, who have taken the time to discuss the project with me, it became evident that some of their deepest regrets are only to discover a mysterious world of trees late in life – a world we humans have, as intrinsic parts of nature, always been connected to but know very little about. To me, this highlighted the importance of stimulating an interest in the science of trees in primary schools and incorporating this into all aspects of the Tree Heritage Project proposal. 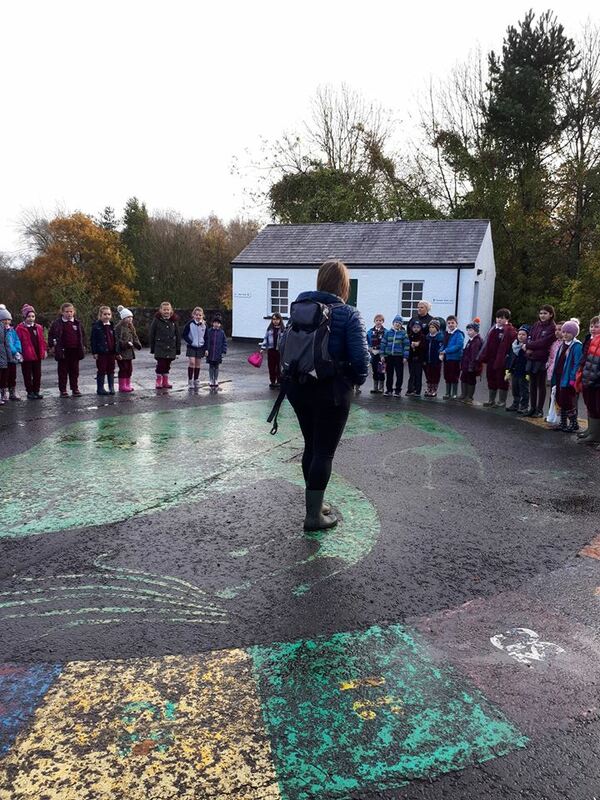 The Lough Neagh Landscape Partnership have impressive plans in place and in action, above and beyond lip service, pursuing the idea of tree planting by involving communities. Imaginative approaches are being be taken to reinforce the connection between local trees and people – regionally developing the Lough shore’s community’s reputation for sustainability, intelligent land management and active regeneration of its woodland resources. It is not lost on the partnership that an attractive, Green rural landscape underpinned by tree and woodland cover, attracts a higher degree of inward investment, employment and tourism, reflecting the type of environment in which people want to live, work and play. It is an initiative launched to re-assert the value of the pristine living wilderness we have on our doorstep, to our economy, our culture, our ecology and our health and well-being round the Lough shore. Many of our remaining trees and woodlands have deep rooted historical and cultural significance and associations, significant to the local identity and sense of place. It acts as a powerful example of Sustainable Development – by acting locally and thinking globally, communities can take direct action to regenerate life on this planet. The aim of this phase of the Tee Heritage Project is to help children better understand the miracle of growing a tree from a seed, its parts, purposes, dynamic changes and cycles, as well as the way its life is interwoven into the very definition of what it means to be human. 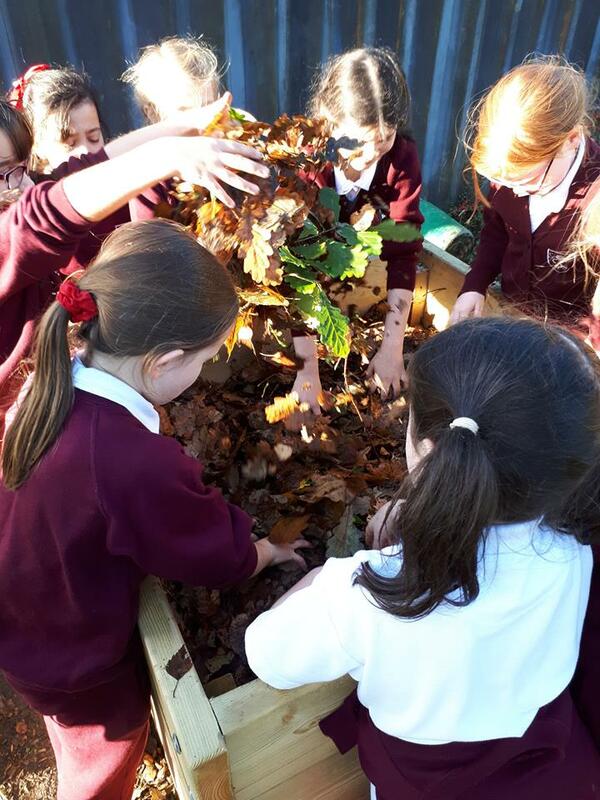 By observing growth patterns so intimately in bespoke school tree nurseries, they are discovering the cycles in a trees life – what it likes and dislikes, what helps it grow, and finally what might kill it. We can never conserve what we do not understand! The box mimics the natural woodland floor of leaf litter to start provide optimum conditions to get the trees off to the best possible start, the sides creating shade to encourage the trees to reach for the light; the fuel of all life, increasing their chances of survival by 90% or more. This works to foster the idea of sanctuary, planting it firmly in their conscious world view. Each one metre by one metre seed box is capable of providing approximately 200 healthy native oaks between 45 and 60cm for planting out every two years. 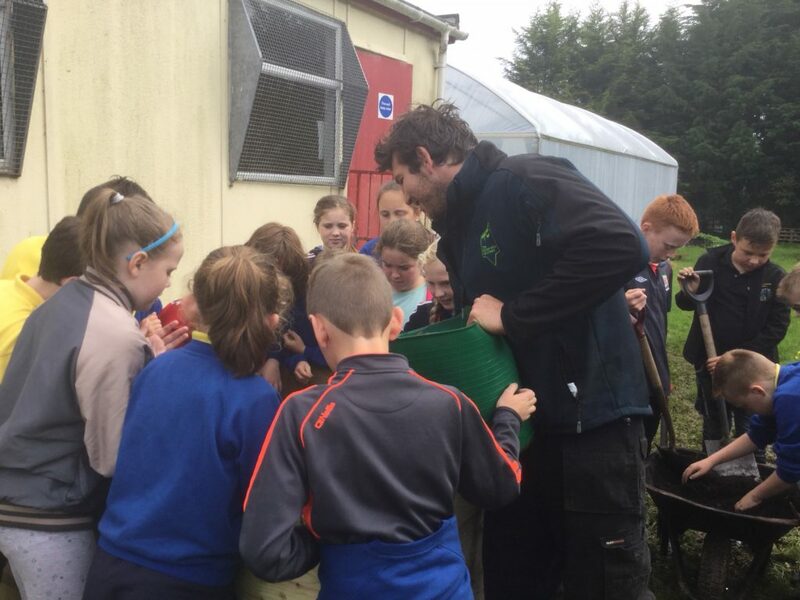 To preserve the local genetic character of trees in the Lough Neagh basin, the seeds are collected by the school children within a ten mile radius as it is a fact that these native trees are the most adapted to the conditions of the area and therefore the most valuable in providing Ecosystem services such as: wildlife habitat, water filtering, soil protection, flood prevention and more. 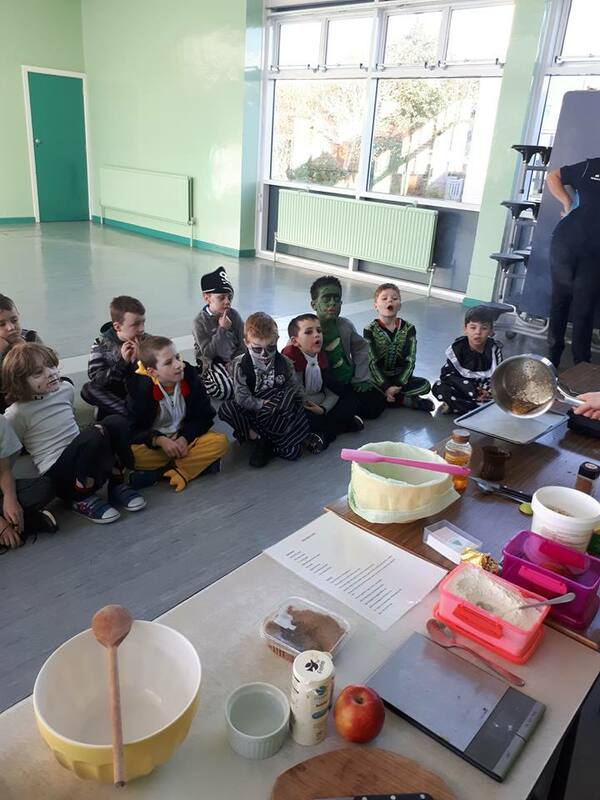 The project creates an opportunity for dynamic Eco-schools committees, providing schoolchildren ways in which they can become involved and make a difference. 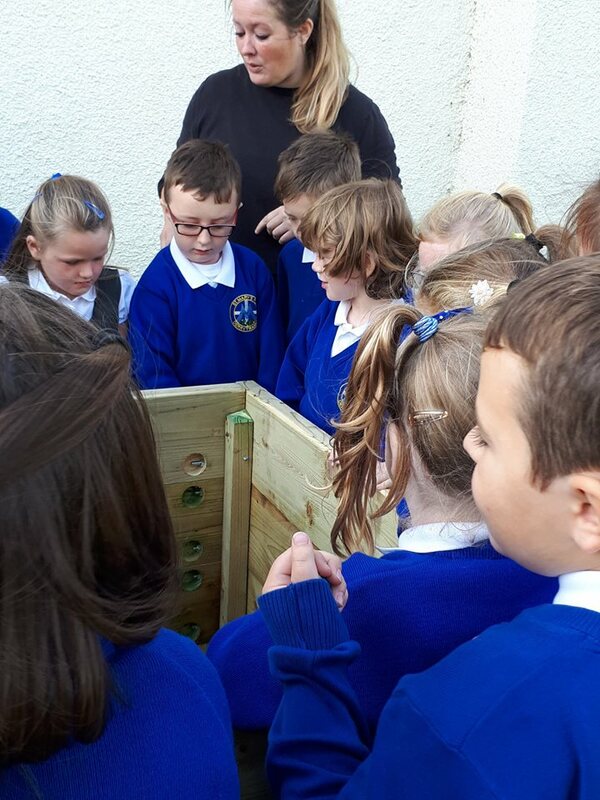 With a view to working as a local action group, each Eco-schools committee will engage with local landowners to co-ordinate the planting site they’ve been allocated as a new community woodland along the shore. With the guidance of LNLP, the trees will be transplanted from the nursery box to project sites into the surrounding Lough Neagh shore landscape, with a view to increasing the number of local provenance oaks in each of the Derry townlands. These are skills are essential career skills in an ever-evolving society, nurturing a sense of ownership and identity with their own landscape. 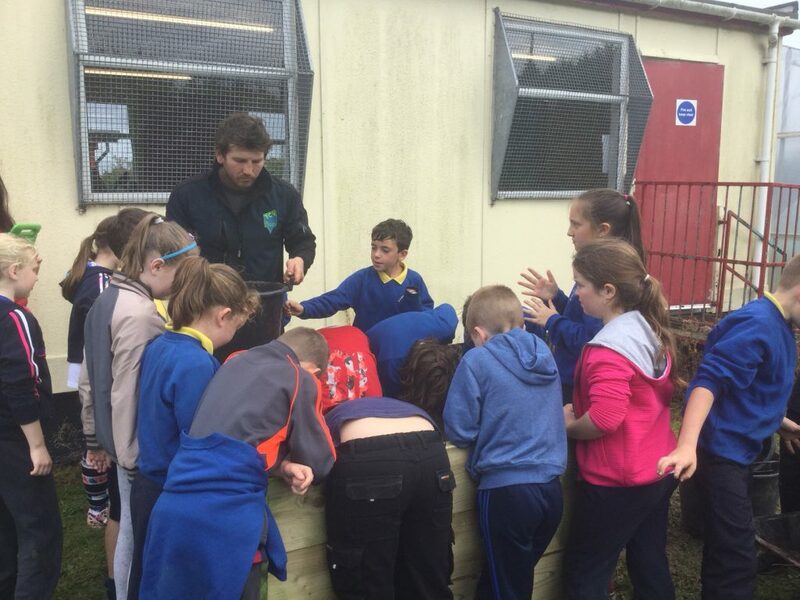 Not only does the forest in a box offer the children practical projects and visions for re-greening our future, but it also provides the perfect platform to develop essential skills to consider our environment on a global scale whilst actively engaging landowners and members of their local communities – inspiring them to plant and care for the trees nurtured in the school’s tree nursery. 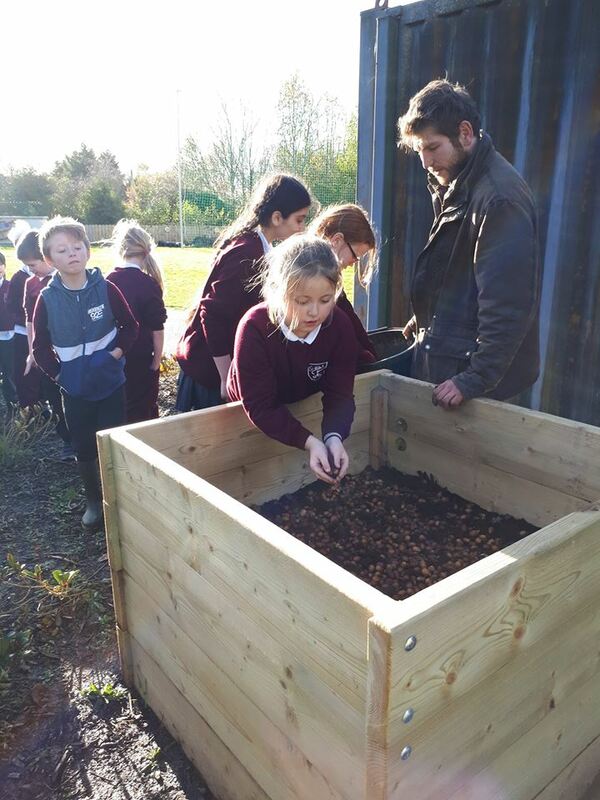 All seven schools approached have been more than supportive of the project, actively encouraging participation of the pupils, from the collection of acorns in the autumn to the installation of the seed box at each school in September. The children visited ancient woodland in late October and November to coincide with the huge acorn mast falls we’ve witnessed in 2017. 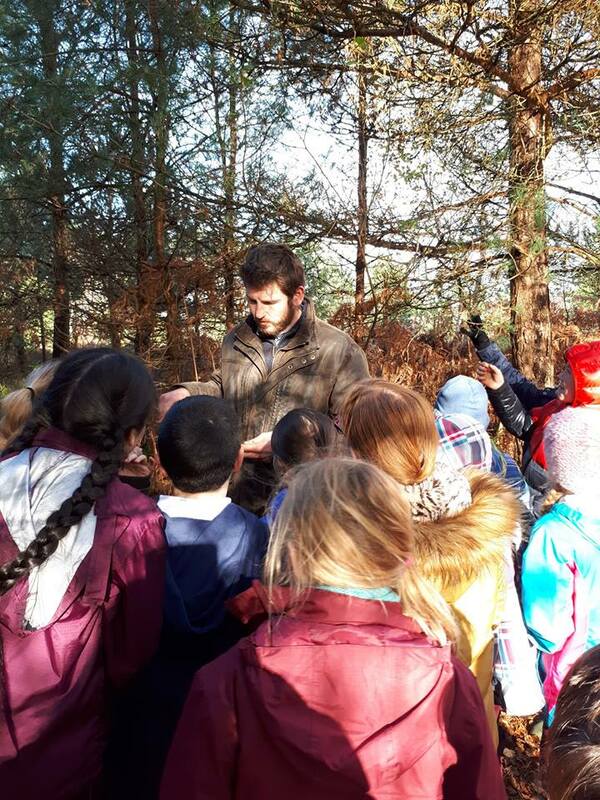 On the day the children learned about The Brehon Laws which laid down specific protection for trees and gave them a hierarchy of importance. It imposed penalties on those who committed offences against “the lords of the wood”, the seven species deemed most important: oak, hazel, holly, yew, ash, Scots Pine and wild apples. The ancient Irish people were regulating tree preservation more than 1,000 years before any other society. 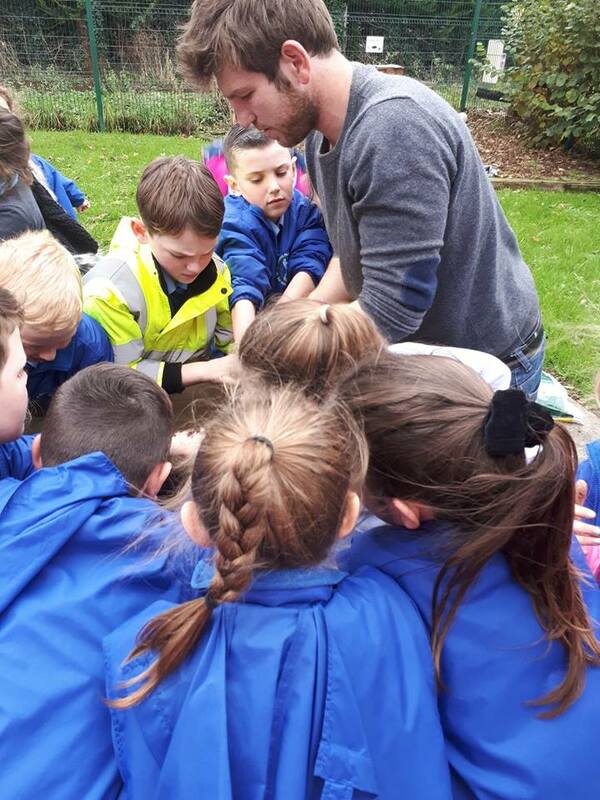 The children were given insights into how trees communicate with each other and filter air, improving air quality by filtering particulate pollutants and locking up atmospheric carbon into their trunks, branches and roots. They can help limit or prevent flooding. 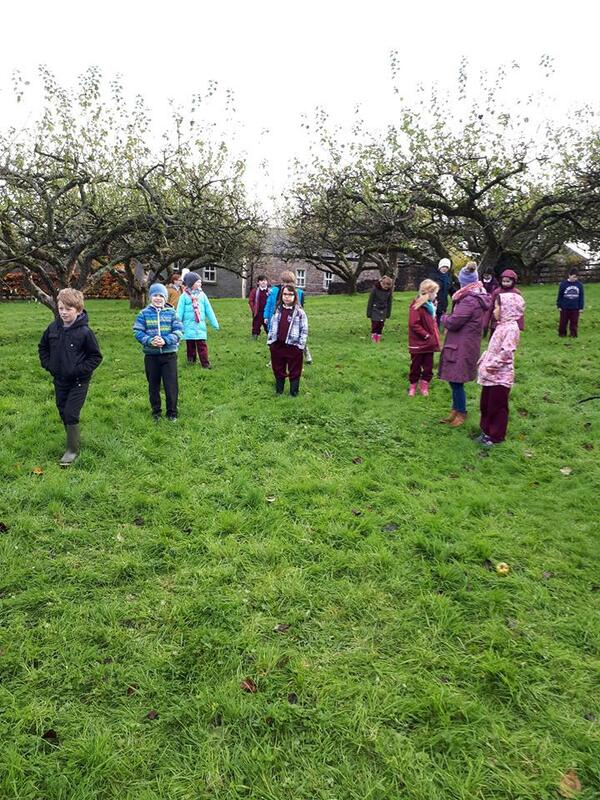 The health and wellbeing benefits of giving curious minds access to wooded areas means that, no matter how much adults believe they know about the world around us, there will always be room to wonder. They witnessed how Oak woodland is nature’s highest achievement in their local landscape. The 1/5th of 1% of fragmented ancient woodlands offered them glimpses of the ‘wildwood’ of prehistory. These still play host refuge for our natural flora and fauna; the birds, mammals, invertebrates, mosses and lichens, fungi, and plants share complete interdependence with them. I told them how a group of trees forms a forest and a forest offers food and protection to sustain life’s great diversity. One individual tree can live hundreds of years, closely collaborating with other species of trees plants, micro-organisms and animals and it is this which gives a tree its miraculous power to flourish, even under the most extreme conditions. Trees are bread baskets to many but also resilient fighters, steadfastly protecting their own ground. Yes, trees are the foundations of forests, but forests are much more than what you see above. Below ground there is another world, a world of infinite biological pathways. These connect trees and allow them to communicate and allow the forest to behave as though it’s a single organism. It was observed how light is the fuel of all life, how it powers the biochemical processes needed for photosynthesis, where trees and other plants combine water (H2O) and carbon dioxide (CO2) to produce sugars and oxygen. Encountering the hidden lives of trees always nurtures a sense of wonderment and intrigue in wild being, wilderness and the processes of life death and regeneration. The recognition of the role of trees and woodlands in modern living is encouraging a new reappraisal in the way they look at trees as a living social network as well as the symbiotic relationships and friendships formed between trees over hundreds of years. This offers them profound templates for how to live, how to communicate and build resilience together. 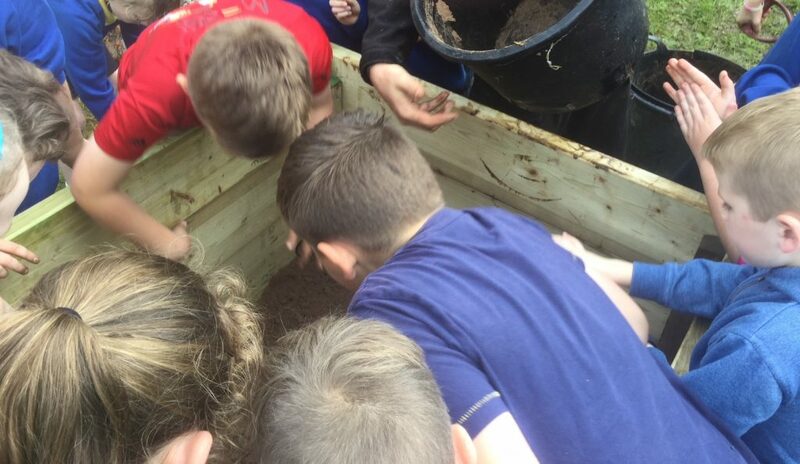 The tree seed incubator box was then activated with the children’s participation, spreading the leaf litter mix, then following up by casting the native tree seeds of sessile oak which they had collected in the nearby Peatlands Park ancient oak wood. 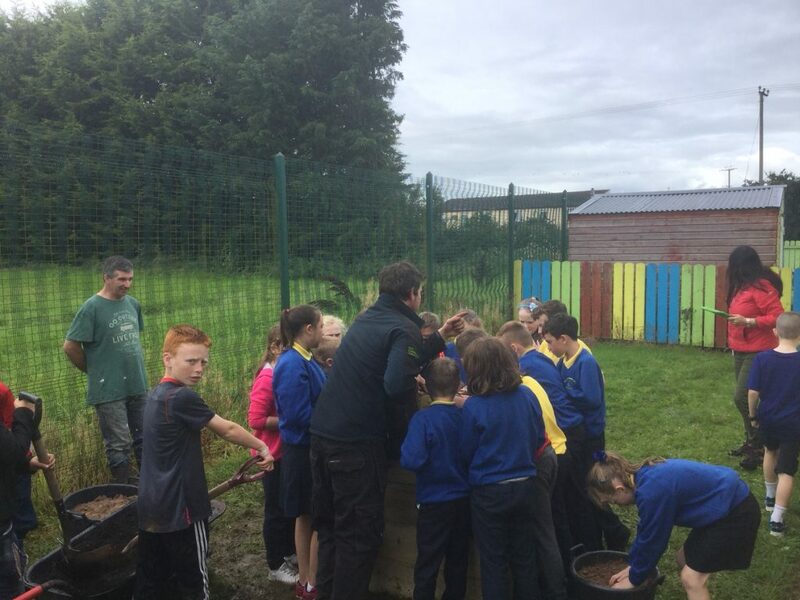 These children are investing time and energy in their own future in a unique way that combines the past, present and future – it is amazing that some of the acorns are from trees that have watched over their families and sustained the art craft and survival of a lough shore way of life for generations. For me, personally, it is fulfilling seeing the children engaged totally in their day outside the confines of the classroom. They are open to appreciate the magic of existence around them and especially in trees, all the while fostering an awareness for the natural world but more importantly a respect for the role they play in it. This is refreshing to see, because with it comes the realisation that Lough Neagh’s woodland culture may be deeply forgotten but it is certainly not lost.